Com­put­ers have invad­ed the mod­ern class­room. Is that good? Our use of com­put­ers (espe­cial­ly lap­tops), smart­phones and tablets is indeed an impor­tant new behav­iour that like­ly will have last­ing impli­ca­tions in the field of edu­ca­tion. From younger chil­dren who play learn­ing games in their ele­men­tary stud­ies to col­le­gians who seem per­ma­nent­ly attached to the e-world via some device, the com­put­er chip has made many things pos­si­ble that nev­er used to be. For exam­ple (and I’ll focus main­ly on the col­lege lev­el for this post), stu­dents can now type lec­ture notes much faster than they could with paper and pen. They can also record some class­room activ­i­ty, to review and digest at a lat­er time. They can also use class time to do e-mails, read social media posts, or watch a movie. Since the pro­fes­sor is look­ing at them only par­tial­ly (their raised lap­top lids block the prof’s view), it would be hard to enforce any announced code of stu­dent con­duct, if one even exists. Dan Rock­more is a pro­fes­sor in the com­put­er sci­ence area of Dart­mouth Col­lege (@Dartmouth). 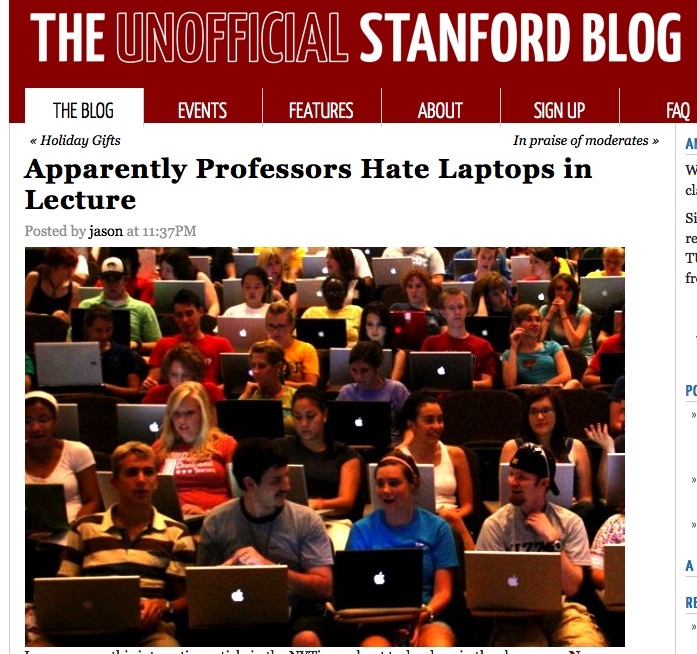 He’s been get­ting a great deal of atten­tion since his 06 June post in The New York­er [link] titled “The Case for Ban­ning Lap­tops in the Class­room.” It’s well worth everyone’s time to read his arti­cle, which pro­vides both points of view on whether com­put­ers are help­ing to cre­ate smarter stu­dents or just more tech-savvy stu­dents. The sub­ject has been a hot one for some time. The Unof­fi­cial Stan­ford Blog, last Decem­ber, car­ried the sto­ry [link] and invit­ed read­er com­ments to this head­line: “Appar­ent­ly Pro­fes­sors Hate Lap­tops in Lec­ture.” Writ­ten with a stu­dent point of view, the short arri­cle pon­dered how a stu­dent doing e-mails in class is any dif­fer­ent than the stu­dent 25 years ago who doo­dled on his spi­ral-bound note­book all class. As we get deep­er and deep­er into embed­ding tech­nol­o­gy into our dai­ly behav­iour set, it rais­es seri­ous ques­tions — some good and oth­ers not so much — about the impact of tech­nol­o­gy on our­selves, our work and how we learn, grow and devel­op. As a pro­fes­sor (although there is lit­tle “pro­fess­ing” these days), this issue is not only a the­o­ret­i­cal one, it is a tan­gi­ble day-by-day con­cern. Here’s what I love about hav­ing com­put­ers at the stu­dents’ fin­ger­tips: (1) access to instant infor­ma­tion, (b) abil­i­ty to request stu­dents to do instant research, (3) abil­i­ty to pro­vide stu­dents time to dig deep­er into a con­cept with­out any delays. I’d also say that many a class ses­sion has been enlivened by some online dis­cov­ery by a stu­dent that is new and vital infor­ma­tion to every­one in the class, myself includ­ed. But there is no deny­ing the down­side to com­put­ers: (1) a much short­er atten­tion span, (2) my need to com­pete for the stu­dents’ atten­tion (and I am com­pet­ing with the world! ), (3) the implic­it dis­re­spect it has for oth­ers in the room (and not just me, but also peers) when one stu­dent is self-absorbed in some­thing “that just can­not wait” or is “more impor­tant” than the pre­vail­ing class dis­cus­sion. A true NextSen­sor would, most like­ly, favour that we study all this much more care­ful­ly before issu­ing a ban on tools that are, with­out doubt, pow­er­ful. Can any­one fair­ly judge tech­nol­o­gy in the class­room before we ful­ly under­stand it? Three truths I would posit at this point. First, we have all become used to tap­ping into the world’s knowl­edge base any­time and any­where. That means we are not only deal­ing with new tech­nol­o­gy, we are deal­ing with new norms. Sec­ond, all of us seem to now ahhere to a “can’t wait” code. What­ev­er infor­ma­tion one seeks, if you can­not find it instant­ly, often leads to aban­don­ment. That is, peo­ple may seek a cer­tain point of knowl­edge; but, if not accessed speed­i­ly, they may eas­i­ly allow them­selves to accept some tan­gent of what they were look­ing for or aban­don the search and just move onto some oth­er mat­ter of inter­est. In the past, researchers had prodi­gious patience. That increas­ing­ly seems to be a lost art. Last­ly, we need to become “cap­tains of our ship” and make good choic­es about how, when and why we are using new tech­nolo­gies — just as we have his­tor­i­cal­ly done with oth­er tech­nolo­gies (elec­tric­i­ty, auto­mo­biles, radios-and-tele­vi­sions). As tech­nol­o­gy becomes more pow­er­ful and more present in our lives, we must ask whether we are dri­ving it, or if it is dri­ving us.